1999-00 Topps Stanley Cup Heroes #SC3 Guy Lafleur (Montreal Canadiens) in mint condition. 2001-02 Upper Deck MVP Masked Men #MM3 Patrick Roy (Colorado Avalanche) in mint condition. 1999-00 Upper Deck Century Legends Greatest Moments #GM10 Wayne Gretzky (NY Rangers) in mint condition. 2000-01 Upper Deck MVP Valuable Commodities #VC6 Martin Brodeur (NJ Devils) in mint condition. 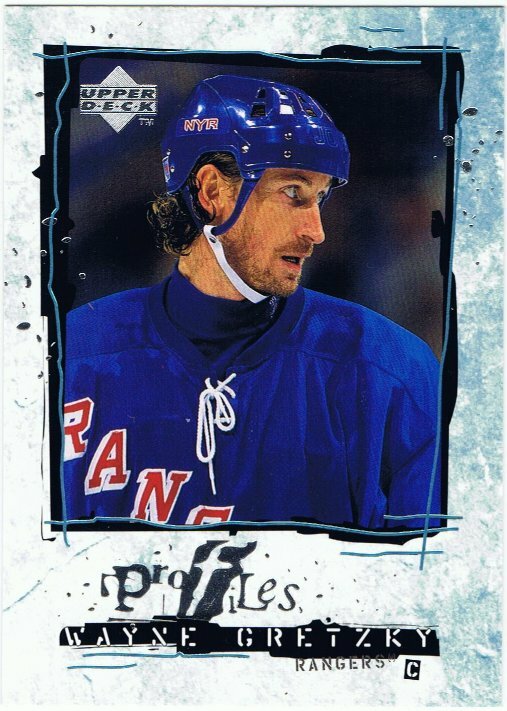 1999-00 Upper Deck HoloGrFx Gretzky GrFx #GG7 Wayne Gretzky (NY Rangers) in mint condition. 2013-14 Panini Contenders Hart Contenders #HC-20 Evander Kane (Winnipeg Jets) #169/499 in mint condition. 2002-03 SP Authentic #95 Peter Forsberg (Colorado Avalanche) #1223/1499 in mint condition. 2012-13 Certified Immortals #124 Ray Bourque (Boston Bruins) #848/999 in mint condition. 1997-98 Pinnacle Epix Game Orange #E1 Wayne Gretzky (NY Rangers) in mint condition. 2012-13 ITG Forever Rivals Net Rivals #1 Johnny Bower/Jacques Plante in mint condition.